In need of an ISO/IEC 14443 compliant access identification solution? Delta Contactless Smartcard Readers and Credentials comprise an advanced radio frequency identification (RFID) solution optimized for electronic access control. Delta makes use of NXP Semiconductors’ MIFARE® technology, perhaps the leading industry standard for contactless smartcards with literally billions of devices sold worldwide. Delta also supports a wide range of third-party contactless 13.56-MHz smartcard-based credentials, as well as the entire range of Delta credentials. 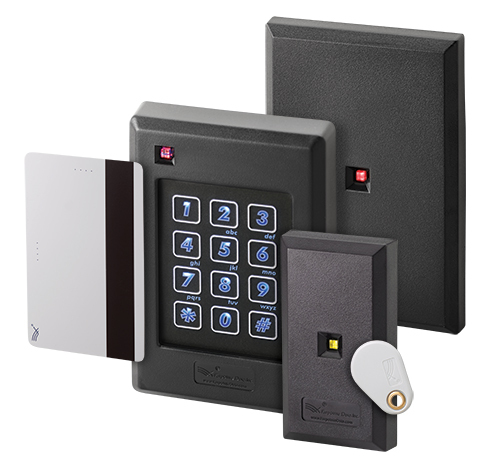 MAXSecure is a security feature available across Farpointe’s product lines. MAXSecure integrates a high-security handshake, or code, between card, tag and reader to prevent credential duplication and ensure that your readers will only collect data from your MAXSecure coded credentials. To obtain a MAXSecure code, please download a MAXSecure Code Request Form, complete the form and send it to your Farpointe representative. ValidID is Farpointe’s newest security feature for the Delta smartcard technology. Delta cards and readers are programmed with a fraudulent data detection system. The reader will scan through the credential’s data in search of discrepancies in the encrypted data; which normally occurs during credential cloning. This new card validation feature is an additional layer of protection to Delta’s validation procedure. © 2016-2019 Farpointe Data, Inc. All rights reserved. Farpointe Data, Pyramid Series Proximity®, Delta®, and Ranger® are the registered U.S. trademarks of Farpointe Data, Inc. Conekt is a trademark of Farpointe Data, Inc.